1. Rendered the original scan. 2. Rendered pictures of crows. 3. Combine each pictures together. 4. Add a dark texture in the middle to somehow give color balance on the wallpaper. I... hmm, like this? The concept is simple but quite nice. I never watched Haikyuu! and from what I know it's a sports anime so I'm not sure why you decided to go for this style but it's surprisingly delighting. It reminds me a bit of Gothics, probably because of the crows, which are a pretty touch, to tell you the truth. I like the feathers, too, and the colors, which are mostly dark yet not entirely black and the combination with white and orange looks cool. I also enjoy how the guys are disappearing in mist at the bottom. I think it was a good move to put the mist there since the BG also looks 'cropped'. I only don't like the paper texture on them and I wish the whole wall was larger. Still, good job and a fav from me. Like the concept, but I don't think that the size that you used is for a screen or wallpaper resolution, actually I see this like the ocean of signatures or banners (or in this case "large piece") like the ones I see from Deviantart, and yea the paper texture really distracts me. Quote by elisadevelonI... hmm, like this? The concept is simple but quite nice. I never watched Haikyuu! and from what I know it's a sports anime so I'm not sure why you decided to go for this style but it's surprisingly delighting. It reminds me a bit of Gothics, probably because of the crows, which are a pretty touch, to tell you the truth. I like the feathers, too, and the colors, which are mostly dark yet not entirely black and the combination with white and orange looks cool. Thank you for the detailed comment. Yes, I was quite lost at first about how to go for a sports anime wallpapers. But a simple and nice would probably be fine. 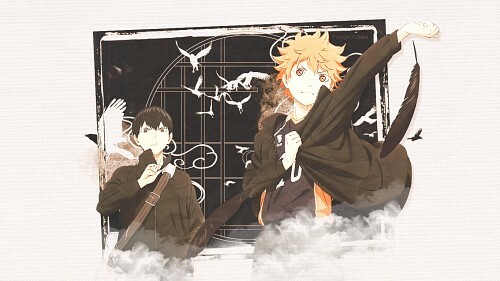 Since the character on the wallpaper goes to Karasuno Highschool which Karasu is translated to be crows that is one of the reason why I use the crow as part of the wallpaper. I was kinda happy you not the color combination since I also love how somehow "balance" the whole features. Once again thank you for the comments. I'll try and improve more from critics. Quote by wafflefoxLike the concept, but I don't think that the size that you used is for a screen or wallpaper resolution, actually I see this like the ocean of signatures or banners (or in this case "large piece") like the ones I see from Deviantart, and yea the paper texture really distracts me. Ah, it's okay. Thanks for the critics I'll try and improve. Well since I basically made wallpaper resolution for my own use which is my own laptop screen so I thought to have them shared here along with everybody else. So that is why I used my laptop screen resolution. I'll keep in mind to make bigger size in future. Thanks again. The Concept is great and besides of the Small resolution i would love to see the Wallpaper with more intense Colors on the Hair and jacket.